Holly Clegg’s Trim and Terrific Freezer Friendly Meals: Quick and Healthy Recipe you Can Make in Advance. I love how Holly starts the book with information about freezing food, what freezes well, can be refrozen, how long it can be stored, what containers to use and other useful information all very well organized. This book is spiral bound so it will lay flat and stay open on your countertop. There’s no meal plans in here and the recipes only come in one size but they are vast and varied. Anything you want to make you can find a recipe and freezer instructions for in this book. A whole chapter is dedicated to fish recipes, a protein source which sadly is often overlooked in many freezer cooking books. Every recipe has a sentence or two describing it, cooking instructions, and instructions to eat it now or freeze it and prepare it after freezing. Every recipe also includes nutritional information. Many of the recipes contain premade mixes, broths, and baked goods but most are from scratch with common ingredients. The pictures look delicious and are surly in the current style but the narrow range of focus on some of them leaves me a little dizzy feeling. The pictures are full page and full color inserted a few places through out the book. 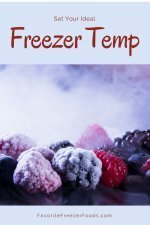 With over 200 recipes if your looking for a freezer cookbook with tons of recipes and inspiration that’s all freezer friendly this book is for you. 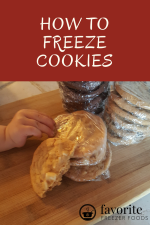 Read more freezer cookbook reviews. Return from Holly Clegg Trim and Terrific Freezer Friendly Meals to the homepage of Favorite Freezer Foods.